Ruling: The BMW M3 is an outstanding performer at home on the open road or at the race track. With impressive road handling dynamics, a powerful 414 hp V8 engine, and a driver experience that few cars can equal, the M3 is a favorite that is coveted by enthusiasts everywhere. The 2011 BMW M3 comes equipped with a 4.0-liter V8 engine that produces 414-horsepower at 8,300 rpm and 295 pound-feet of torque at 3,900 rpm. Though a six-speed manual transmission is standard, an M Double-clutch Transmission with Drivelogic is optional. BMW reports that the 2010 M3 has a top speed of 155 mph and can accelerate from 0 to 60 mph in 4.7 seconds with the coupe, 4.8 seconds with the sedan, and 5.1 seconds with the convertible. EPA estimates that the BMW M3 nets a city/highway fuel economy of 14/20 mpg. Assisting performance for the rear-wheel drive BMW M3 is vehicle-speed-sensitive variable-assist power steering that BMW calls M Servotronic. The M3 also features a sport-tuned M suspension system. Electronic damping control, is available as an option for the BMW M3. Additionally, Dynamic Stability Control (DSC) helps the M3 maintain road composure, while an Anti-look Brake System (ABS) and Dynamic Brake Control bring it to a safe and secure halt. 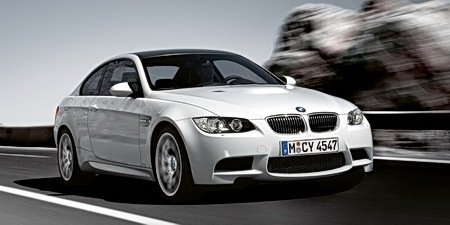 The 2011 BMW M3 is available in three body styles: coupe, sedan and convertible hardtop. Power and speed that will get you in trouble with the law. Superb handling on the road and on the track. Super quick double-clutch transmission. Styling of the coupe is enough to separate itself from its 335is brother with its fender and hood bulges, aerodynamic treatment of the front and rear, and the carbon fiber roof. Stiff suspension, even on the softest setting, can wear you down on long trips. Interior is plane-Jane compared to an Audi A4. BMW interiors have always been more function over beauty. Accelerating off the line requires a very, very smooth style. Otherwise, you experience violent drivetrain lash and a very rough start. There is nothing low profile about the M3. Be prepared to turn heads wherever you travel. And that includes extra attention from law enforcement officers. If you have an enthusiasm for driving beyond getting groceries and taking the kids to their ball practice, the M3 does a lot more than put a big grin on your face.